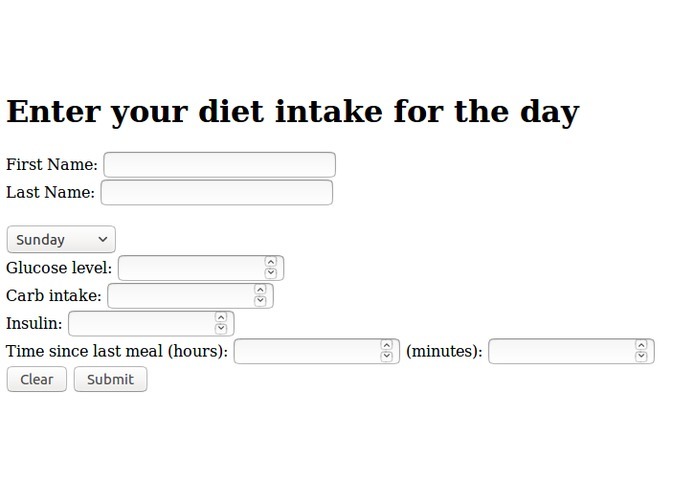 Daniel's brother has diabetes, and he wanted to build something that could help him manage his diabetes by logging his daily activity and displaying it to him graphically. The "web app" takes in a diabetic person's blood glucose level, intake of carbohydrates, insulin dosage, and time of day to log a meal. That meal is then stored in a database of meal records and gives the diabetic how well he or she has been managing his or her diabetes. The user data is also saved to a text file that is appended to as the user enters more info, which if given more time we could have done some cool stuff with. We all learned a lot and successfully got a web server (and technically, DynamoDB) up and running. None of us had much experience in python or php before tonight and we each learned some code for either of those. We also got some experience with AWS. I worked on setting up our project to run on a micro AWS EC2 instance. I was responsible for configuring Flask and Apache on the instance to accept the connecting module built by other group members.